Ed Sheeran has broken the record for the most tickets sold by an artist in Ireland in one day after over 300,000 tickets were sold for his 2018 tour on Saturday. The chart-topper is set to play seven dates in May of next year. Six of the seven dates are now sold out, with a limited amount of tickets remaining for the Wednesday May 16 date at Dublin's Phoenix Park. Fans of the Shape of You hitmaker were left frustrated on Saturday with the long wait times to purchase tickets to next year's Irish summer shows. Tickets to the huge outdoor shows in Cork, Belfast, Galway and Dublin went on sale on Saturday morning at 9am, but many fans had to wait hours in a "virtual queue" to purchase the tickets. Ticketmaster addressed the issue on Twitter, asking fans wishing to buy tickets to see Sheeran's Irish shows in May 2018 to stay calm and not to refresh their queue page. "It’s a busy morning and we’re selling tickets fast. To ensure fair access some of you may see queue pages, please follow the instructions," the company said in a statement. Judging by the reaction on Twitter, many fans have had a stressful morning trying to purchase tickets to the shows. Don't know if I'm more frustrated trying to get #edsheerantickets or watching the #lions ! Sweating!!! I just dont understand how a company who's sole purpose is to sell tickets can be so bad at selling tickets. However, it seems like it was worth the wait for fans who managed to land tickets. Sheeran’s 3Arena gigs earlier this year sold out in five minutes and fans have been just as eager this morning to pay €81 and €91 for tickets for the singer's Irish shows next year. Edmania truly broke out in April and the unstoppable Sheeran surge continues with some fans likely to be disappointed in the rush for tickets. Tickets for Sheeran's Irish tour dates are subject to strict anti-tout rules which have been brought in to try to stop people reselling them online for extortionate prices. Promoters for the gigs have said resold tickets will not be valid for entry and concert goers will have to provide their booking confirmation, credit card, and a valid form of ID. However, despite the strict anti-tout rules, tickets for Sheeran's Irish gigs have popped up on the ticket reselling site Viagogo and eBay at inflated prices. In a related Ed Sheeran story, the UK Official Charts Company has altered how it compiles the Top 40 in an effort to prevent A-list artists "elbowing newer acts out of the way, " as the BBC News website expresses it. The move was prompted by Ed Sheeran, whose latest album proved so popular that it drove no less than 16 tracks into the top 20 in March. Sheeran is the principal victim of the new rules, with several of his songs adversely affected. Last week, the singer had eight songs in the Top 100. This week, he has three. Four of those former hits dropped out because their sales declined following a brief, post-Glastonbury peak. However, another song was excluded from the countdown because, under the adjusted rules, artists are allowed a maximum of three songs in the chart at any one time. 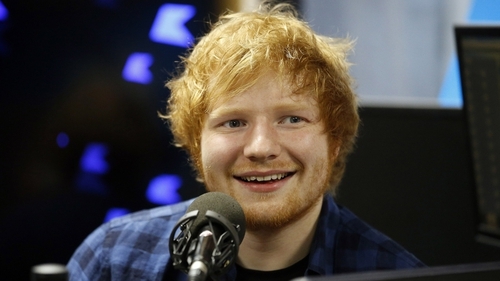 A number of other Ed Sheeran songs fell down the charts, as a result of a second rule penalising tracks that are "well past their peak and in steep, prolonged decline"
For those songs, the Official Charts Company is applying a new formula, whereby 300 streams count as one sale (for newer songs, the ratio is 150:1). The rationale is that the longer a song has featured in the charts, the quicker it will fall out of the top 100. As a result, Sheeran's former number one, Shape of You, which has been in the Top 40 for 26 weeks, suddenly fell 12 places following weeks of steady decline. As a consequence of the chart revamp, more new entries have squeezed into the British Top 40 this week than in any other in the year to date.